What ActiveCampaign Triggers and Actions are Supported? Updated Contact - Triggers when an existing contact details are updated. New Campaign Starts Sending - Triggers when a new campaign starts sending. New Campaign Unsubscribe - Triggers when a contact unsubscribes as a result of a campaign email sent to them. New Deal Note - Triggers when a new deal note is created. New Campaign Open - Triggers when a contact opens a campaign (will trigger once per contact per campaign). New Deal Task - Triggers when a new deal task is created. New Deal Added or Updated - Triggers when a new deal is created or existing deal is updated. New Contact Note - Triggers when a new contact note is added. New Campaign Link Click - Triggers when a contact clicks a link in a campaign message (will only run once for each unique link). New Campaign Bounce - Triggers when a contact email address bounces from a sent campaign. New Automation Webhook - Triggers when an automation sends out webhook data. To add a webhook in ActiveCampaign, navigate to your Automations section, add or edit an automation, and create a new "Webhook" action. New or Updated Contact - Triggers when a new contact is added or existing contact's details are updated. New Contact Added to List - Triggers when a new contact is added to a list. Create Campaign - Creates and sends a new campaign. Update Deal - Updates an existing deal. Create Deal - Creates a new deal. Add Contact Note - Adds new contact note. Add Note to Deal - Adds a note to a deal. Create/Update Contact - Creates a new contact, or updates an existing contact. 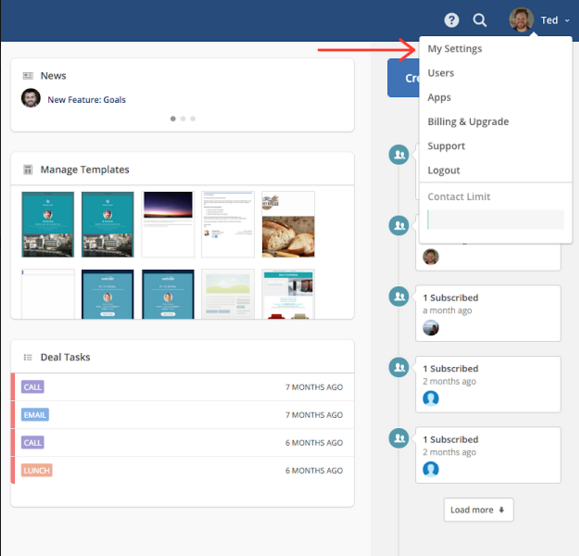 Add Contact to Automation - Adds an existing contact into any automation. If contact does not yet exist, a contact will be created and then added to the automation. Create Tracked Event - Creates a custom website or application event. Find Contact - Finds a contact by email address. Find Deal - Finds an existing deal by title or email. Admin/owner permissions - You don't need a certain role in order to use ActiveCampaign. However, users can have the following areas restricted, which may result in those areas not showing up in Zaps: Lists, Campaigns, Contacts, Subscription Forms, Templates, Reports, and Deals (applies to Small Business and Enterprise only). The ability to restrict user permissions is only available to Plus, Professional, Enterprise and Trial accounts only. Paid/versioned account - All of ActiveCampaign's paid plans (Lite, Plus, Professional, Enterprise) work for all Zapier integrations. Custom field support - For the most part custom fields are supported. 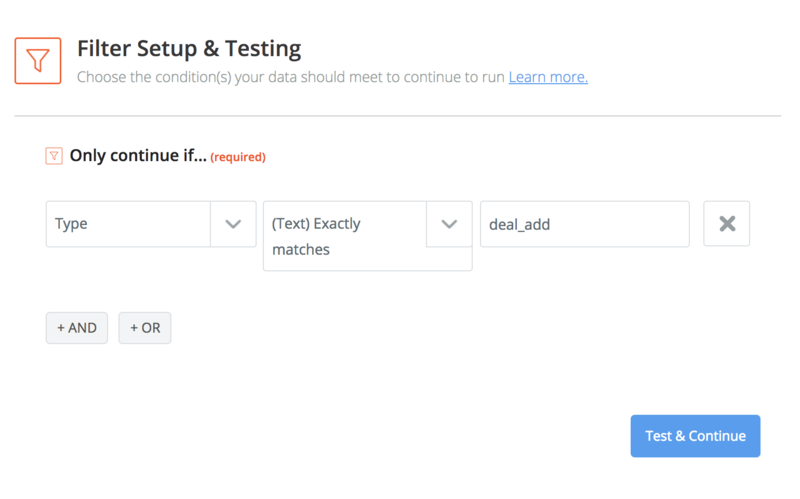 However, in certain Actions such as "Find Contact" and "Create Deal", custom fields are not supported or returned. Partner documentation - May be found here. 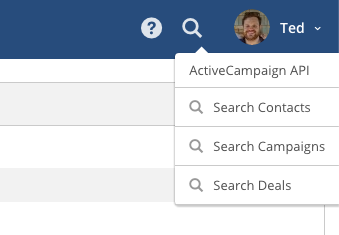 To get started with ActiveCampaign, first click "Connect an ActiveCampaign Account" button on step 2 of your Zap. The form will ask you for your API URL and key, which can be found in the settings section of ActiveCampaign. You can also type "api" into the search bar to find the section right away. You'll find your API URL and key in the Developer section. You should then see a successful message saying you are connected! 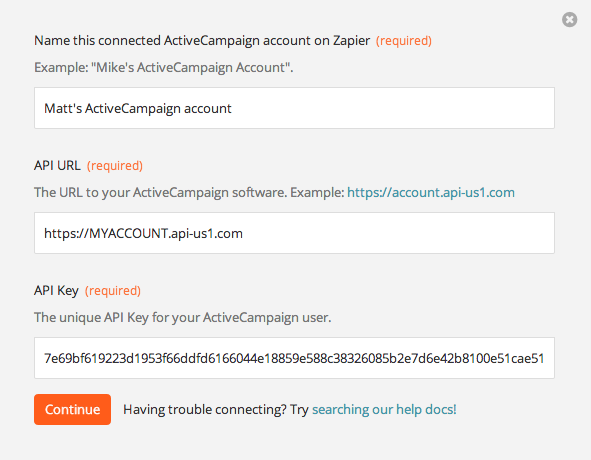 Right now, Zapier can only be used with ActiveCampaign's hosted version (the one on activecampaign.com). If you are using the on-site (self-installed on your own server) then you will not be able to use Zapier with ActiveCampaign right now. When adding multiple options in a multi-select custom field, use double pipes (||) as the delimiter between options. 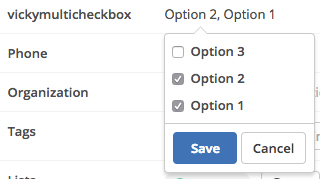 To select both "Option 1" and "Option 2", fill in the field in the action template with Option 1||Option 2. While these certainly aren't the only rules that might trip this error, you may want to check the data that is going to ActiveCampaign. If you are only expecting to trigger from new subscribers, what you will need to do here is add a Filter step to your Zap so that only new subscribers will Trigger.